In 2017 we were honored to be chosen for the Iowa Environmental Leader Award. Pictured at the Iowa State Fair receiving the award are: L-R Bill Northey, Secretary of Agriculture, Chuck Gipp, Director of DNR, Phillip, Nick, Laramie, LaVon, Mackenzie, Autumn, Craig, Julia, Governor Reynolds, and Lt. Governor Gregg. 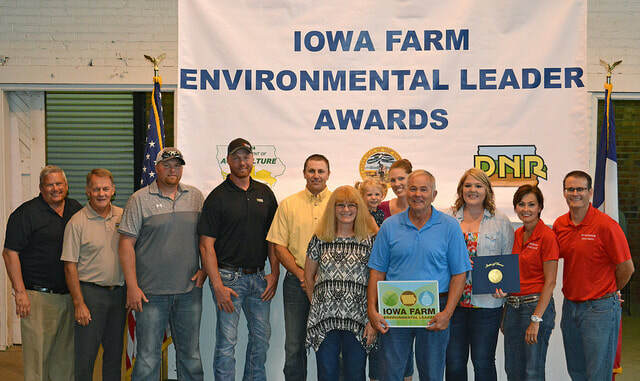 To see a complete list of the 2017 Iowa Farm Environmental Leader Award winners, click here. Click below to save or print a copy!